An interesting and well-played disc of three widely differing twentieth century classics. It might seem like improbable programming juxtaposing the Rite of Spring and Rhapsody in Blue with La Valse as some kind of musical sandwich between but actually it works rather well. This is due in no small degree to the virtuosity of pianist Eric Ferrand N'Kaoua. EFN'K - as the liner likes to acronym him - has a formidable technique and an ability to bring clarity to the most complex of textures. transcription - distillation really - is a remarkable achievement. On-line I read a very interesting and extended interview with Raphling - which sadly also makes no mention of why or when he made this version. What is telling is his experience in the Chicago Symphony Orchestra as their orchestral keyboard player working with the likes of Toscanini and Rachmaninov. One cannot help but deduce that that experience of an orchestra from the inside allied to his skill as a keyboard arranger has helped him produce a work which contains the essence of the Stravinsky's huge masterpiece. Indeed time and again I was struck by how little of the original work seemed to be missing even though logic tells you substantial portions of inner texture must be absent. Which is why I used the word distilled; there is a curiously counter-intuitive thing happening here. Although this is the very epitome of a complex and thickly textured work both Raphling and EFN'K keep it very 'clean'. There are none of the usual piano transcription extra fireworks - probably due to a lack of time or fingers. I did wonder if the original purpose of this transcription was to provide a keyboard version for the ballet rehearsal room - which did lead me to wonder how did ballet companies rehearse this work in the studio before the advent of decent recordings? Through no fault of player or transcriber what is missed is the variety of timbre and texture. Stravinsky uses his large instrumental group not so much to give a massive weight of sound but rather to allow timbral groups within sections; hence a flute group is pursued by a clarinet figuration or massed horns play in one rhythmic pattern where the percussion and strings play another. All of these ear-leading sub-divisions within the orchestra are subsumed into a mass of piano tone. EFN'K is very good indeed at creating as much tonal variety as he can and only once or twice are the characteristic steady rhythmic ostinati rocked fractionally by the physical impossibility of getting around all of the keyboard in time. Interpretatively this is quite a centrist view with few extremes of tempo or musical vision. I have not heard any of the other solo piano versions available but this strikes me as enjoyable and impressive. I see that on RCA/Delos the first performer of the Raphling transcription - Dikran Atamian - released a performance of this version but I have not heard it. Maurice Ravel produced his own solo piano version of his great La Valse. This is much better known and more often recorded in this keyboard version than the Stravinsky. Even though it shares a twin existence as both a solo piano and an orchestral work alongside the Rite this sounds more like a work conceived for and on the keyboard. The great virtuosic flurries and flamboyant gestures speak of the piano more than the orchestra - much as I enjoy that version too. Again, EFN'K proves himself fully up to the demands of the work and gives it an exciting and impressive performance. As with the Stravinsky, I particularly admire his ability to clarify the textures and articulate complex passagework. There is a valid alternative which treats the piece as more of a latter-day virtuoso vehicle. I remember a very early CD from Geoffrey Saba on IMP which emphasised just that aspect of the work to great effect although with a slightly strident recorded sound. Indeed, it could be seen as a performance characteristic of EFN'K that he favours a degree of objectivity in all of the works presented here. Not that it lacks drama or musical power but rather that he values other aspects of performance higher still. This objectivity - to my ear at least - seems least rewarding in the group of Gershwin pieces. The inclusion of the Three Piano Preludes runs slightly contrary to the rest of the 'transcription-themed' programme. Again clarity and precision is to the fore but here - and in Rhapsody in Blue - I miss a degree of warmth and affection that I feel is vital. Also, EFN'K rarely allows any received performance practice ideas of swung 8ths (jazz triplet quavers). All the rhythms are 'straight'. Again, I can imagine some listeners will prefer this rather dry-eyed approach finding other versions too sentimental or mannered. But few would disagree with the actual pianistic beauty of his playing of the central prelude - No.2 in C sharp minor which is subtitled here "Blue Lullaby". Although why - as EFN'K writes in his own liner - this "conjures up 1920s Manhattan to perfection" escapes me. By all means write such a comment - but then justify it! 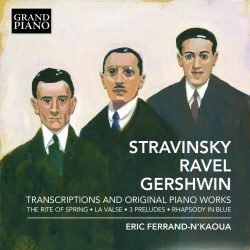 The solo piano version of Rhapsody in Blue seems to be a version of Gershwin's own short-score of the work he produced as part of the composition process. As such it is not a transcription or distillation - more the pianistic nuts and bolts of how it was put together. Again, the remarkable achievement is how little the ear misses - once the unmistakeable sounds of the jazz band/orchestra are accepted as absent. EFN'K is very impressive here at layering the music so there is a sense of solo keyboard and accompaniment. Once more, I do find him less playful and more objective than my ideal performance might be but he does find an ideally sonorous and expressive intensity for the 'big tune' that appears two thirds of the way into the work. Throughout EFN'K is helped by a recording that is quite close but shows his Steinway D piano as being in exceptionally good condition - rich and powerful across the whole range. The recording venue is nicely neutral without any undue resonance but providing the right amount of warmth. The main works are usefully subdivided into multiple tracks; twelve for The Rite and three for Rhapsody in Blue. EFN'K's liner is in three languages; French, English and German and is reasonably useful but with rather too many key details missing for these unusual versions of well-known works. The CD cover is slightly odd; a painting of the three featured composers which makes them look like waxworks or zombies. As an appendix to the more familiar orchestral versions of these famous works this is a wholly enjoyable and well-performed anthology.